There were two known members of the Rabbs fringe-limbed treefrog species living in captivity until last week, when one of the Rabbs was euthanized. His health had been declining, he was suffering, so Zoo Atlanta herpetologists decided to euthanize him to save any genetic material they could for further study of the species, only just discovered in 2008. The remaining Rabbs is kept at the Atlanta Botanical Garden. We don't know exactly how long Rabbs have been in existence, but scientists are fairly certain that after him, the species will be extinct. The Rabbs, distinguishable by webbed feet and fringes of skin along his limbs, is known to leap from tree branches onto the ground into a smooth skid, kind of like a ball player sliding into second base. Dwight Lawson, deputy director of Zoo Atlanta, said "This is the second time I have literally seen one of the last of its kind die and an entire species disappear forever with no trace of it. It is a disturbing experience and we are all poorer for it." 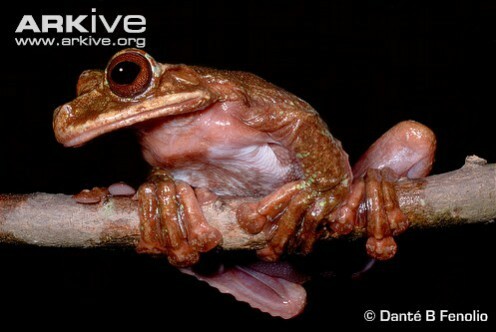 The Rabbs fringe-limbed treefrog is one of thousands of endangered amphibian species that are being devastated by chytridiomycosis, a deadly fungal disease. Amphibian populations are also being wiped out by forestation and climate change. That's the sad buzz for today!